Last year we were delighted to be contacted by a couple with this email note: My husband & and I have been stalking your site for a year, waiting until our yard was ready to get a shed. I think we're close! We are in downtown Orlando, have a 1911 colonial revival/farmhouse. We knew we'd like them instantly. They live in the lovely Lake Eola Heights Historic District in Orlando, located within walking distance to downtown Orlando. The houses were built primarily between 1890 and 1925 and have an amazing array of styles and detail. Theirs was full of texture and character. 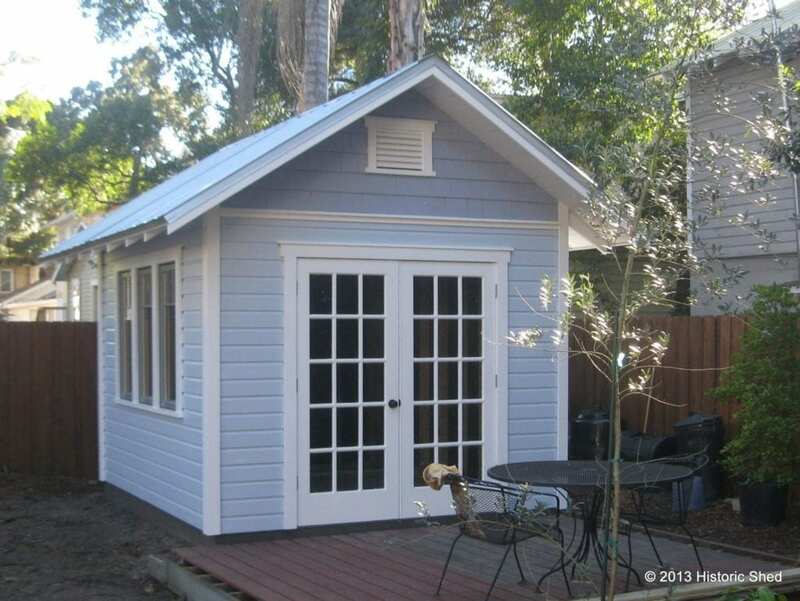 They didn't need an overlarge shed, but it needed character and lots of windows. And to be a test case for the colors they planned to paint their house. Because the property is located within a designated historic district, the shed design was reviewed by the local historic preservation office. A couple of months after we were done, we received this lovely email note with the photo below: Just wanted to let you know how happy we are!! We don't have much in the ground yet- but the veggies are happy- waiting on electric & water to go in, then the brick paths- then garden beds will be better defined. We have spent more time in the back yard in the past few months than we have in 3 years!